If you created your own DayBack Online account you're already an administrator and clicking on "Settings" in the calendar's left-hand sidebar will reveal an "Administrator Settings" button that will let you configure sources. Finally, if someone invited you to join their DayBack group they can decide to make you an admin of the group or not: ask them nicely. Once you arrive at Admin Settings, you'll see "Calendar Sources" in the left-hand sidebar. 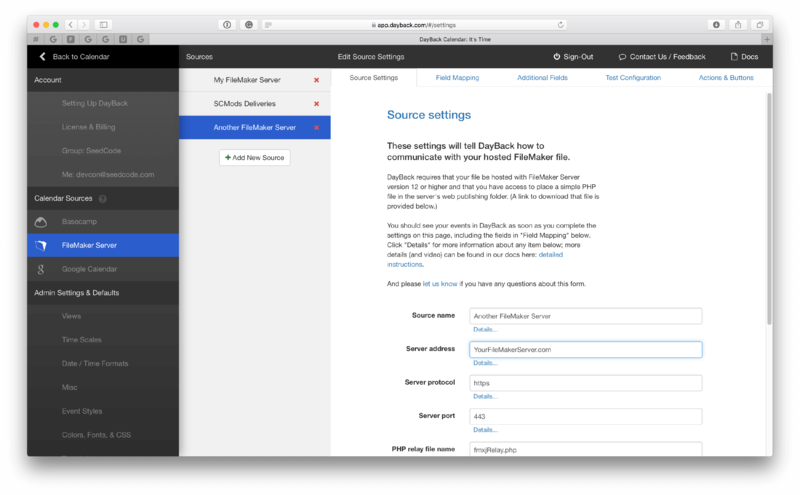 Click "FileMaker Server" and then the button to add a new source (you can also edit an existing source if one is already there). Follow the instructions in the right half of the screen and you'll be up and running shortly. Please get in touch if you have questions.